Indian Institutes of Technology or IIT in short are independent Public Institutes. There are twenty three IITs in India and each of them provides higher education to the students. The staffs of IIT are mainly divided into two parts such as Faculty members of the staff and the Non-faculty members of the staff. The pay scale of the staffs follows the Pay Band. The Pay Band of the staffs of IIT differs as per their designation. The Pay Scale of the IIT staffs are not same. The head of the staffs is considered to be a director in IIT. The salary of a director falls under the category of Apex Pay Band and the salary is always fixed. The other staffs of IIT are covered under PB-1, PB-2, PB-3 and PB-4 as per their designation. The post of a director is considered to be the highest for any IIT staffs and the salary of a director is also fixed. The salary of a Director of IIT is Rs. 80, 000 and he falls under the category of Apex Pay Band. The lowest post in IIT is Junior Attendant and he is paid according to the PB-1 category. The salary of a Junior Lab Attendant is usually Rs. 16, 000. Staffs of IIT are also paid grade salary besides basic salary. Without the director of an IIT, all the other staffs are provided with a grade salary. The grade salary of IIT employees differ as per their designation and contribution to the institute. The second highest post of the IIT is the post of a Professor who gets a grade pay of Rs. 10, 500. The lowest post is Junior Attendant who gets a grade pay of Rs. 1, 800. The salary of a director is fixed and falls under the category of Apex Pay Band and is paid Rs. 80, 000. IIT staffs are granted transport allowance for compensating their transport expenses incurred by them to attend their daily duties. The minimum rate of transport allowance is Rs. 75 while the maximum rate is Rs. 400. When the duties assigned to an IIT staff requires extensive travelling, IIT staffs are granted with cycle allowance of Rs. 30 every month. IIT staffs are granted a washing allowance of Rs. 30 per month so that the staffs can get a compensation for washing of their uniforms. If a Staff of IIT works beyond their normal duty to complete a specific task, they are granted with Overtime Allowance. The rate of overtime allowance is Rs. 2, 200 per month. The staffs of IIT are granted a house rent allowance so that the employees can compensate their expenditure incurred by them while paying their house rent. The staffs of IIT also gets Conveyance Allowance, Non-Practicing Allowance and Festival Advance Allowance. The rate of Festival Advance Allowance is Rs. 1500 and the rate of Non-Practising Allowance is Rs. 29, 500 per month. The rate of Conveyance allowance differs as per the designation of the employees. 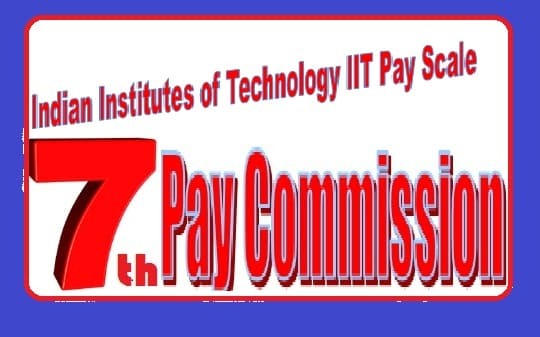 A multiplication factor of 2.57 will be applied to the pay scale of an IIT staff and his salary will be 2.57 times greater than the current rate as per 7th Pay Commission. The extra benefits provided to the government employees will also be increased as the rate of allowances will be increased as per the 7th Pay Commission. The staffs of IIT will enjoy an increment annually of 3 percent and the minimum basic salary plus grade salary for any IIT employee has also been raised to Rs. 18, 000 which was Rs. 7, 000 previously.